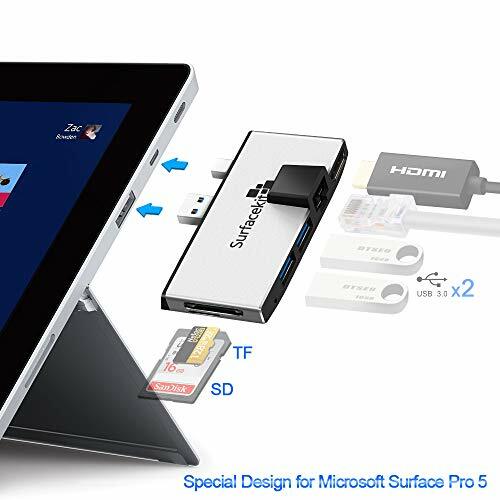 Surfacekit USB 3.0 hub combo adapter perfectly match with Surface Pro 5(distance between USB 3.0 to mini DP is 12.00mm), 5Gbps high speed USB 3.0 x 2, SDXC card slot x 1, micro SDXC/TF x 1, 1000M Ethernet LANx1. Surfacekit hub adapter with dual USB 3.0 port, up to 5Gbps high speed than 10X fast than USB 2.0 hub. Transfer videos and images just in seconds, saving your time. 1000M high speed surfing on your surface pro 5, enjoy a fluently network environment, without annoyance. Surfacekit multiple combo hub adapter with 12.00mm distance between USB to mini DP, provide a 4K/2K@30Hz high definition pictures or videos for you through the 4K HDMI port.